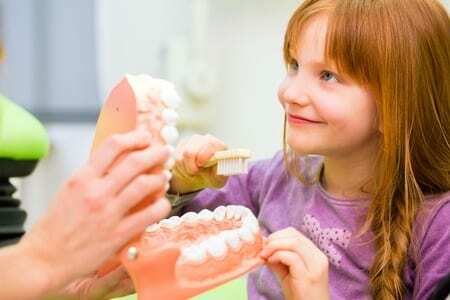 When it comes to your child’s dental health, it’s important to find a children’s dentist that makes your little one feel comfortable and safe during their trip to the dentist. We understand that a child’s first visit to the dentist can seem scary. Our staff are friendly, attentive, and experienced with child management in the dental setting. We would love you watch this fantastic video ‘Protecting Tiny Teeth!’ Just like in the full version. It’s often thought that baby teeth will “fall out in a few years” and that there’s no need to look after them. However, baby teeth are necessary for developing correct speech patterns, for eating purposes, and for helping the adult teeth come through in the right positions. Also, the pain from decayed baby teeth can be very distressing for children, and sometimes very difficult to treat. When do baby teeth come through? Teeth start to erupt between 7-12 months of age but all 20 baby teeth should be there by the age of 3. This can be a challenging time for parents and the baby can show various signs of teething, which include excessive salivation, red cheeks, irritability and fever. Our teething advice is to treat the temperature and pain with your usual painkiller eg children’s Panadol or Nurofen. Cold face washers to chew on can be effective on sore gums as well as cold chew toys. You could also try the topical anaesthetic types of gel like Bonjela. However, you may find that a combination of comforting and distracting your child effective too. When should I start brushing my child’s teeth and how do I introduce tooth brushing? The front baby teeth fall out between 6-8 years old, then baby teeth are progressively lost up until the age of about 13. The adult back teeth are the most important teeth to keep and maintain healthy. Decay occurs when the bacteria in your mouth eat sugars and starches from your food and drink. They then produce acids which decay or “eat away” the tooth, just like rust eats into iron. This is called an ‘acid attack’. Tooth decay is a preventable disease. Think of the 5/2 rule. Children should eat 5 times a day and avoid grazing; Breakfast, morning tea, lunch, afternoon tea and dinner is perfect. Children should brush their teeth 2 times a day (after breakfast and especially just before bed). They should only drink tap water in between breakfast, lunch and dinner. Sugary fluids should not be placed in infant feeding bottles and comfort sucking on a bottle should be discouraged. Never put sugary fluids eg honey on dummies. A common myth is that decayed baby teeth leads to decayed adult teeth. This is not true. However, any poor habits established during childhood will be carried into adulthood, so for your children’s health, try to develop good habits as above. Brush their teeth twice daily. Practice the 5/2 rule. Drink tap water in between meals. Take them for regular dental check-ups starting from the age of 2 years. Follow the dentist’s advice regarding preventive treatment e.g. fluorides and fissure sealants. Read its full version here.